Green Bay Harvest 10+ Active Raw Manuka Honey only gets a coarse filtering before being put in the jars. The honey is sourced from trusted beekeepers in New Zealand's pristine South Island. 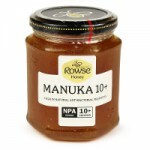 An intense flavoured certified manuka honey with an NPA rating of 10+ imported by Rowse from New Zealand. 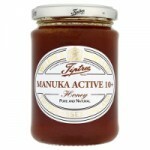 This is a moderately potent manuka honey for those looking for one with antibacterial properties.